I read two chapters from this anthology. Here are two brief, rough synopses of them. Perchance they shall be of some use to the curious:Said, Edward. 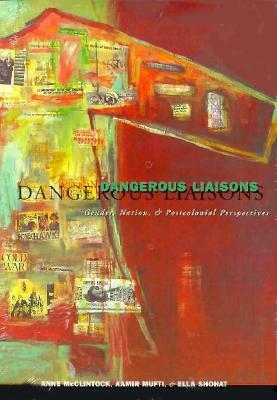 “Zionism from the Standpoint of its Victim.” In Dangerous Liaisons: Gender, Nation, and Postcolonial Perspectives. Edited by Anne McClintock, Aamir Mufti, & Ella Shohat. Minneapolis: University of Minnesota Press, 1997. 15-37. Said begins by lamenting the prevalence of a pro-Zionist hegemony in the West, apparently in both government and academia. Zionism had both a provenance – being the product of a long lineage of ideas, and a cumulative nature that comes from its progressive accumulation of power, legitimacy, etc. Said feels that he is in a unique position as an Arab raised in the West to write about Israel; he renounces anti-Semitism all the while being aware of its important influence on the history of the Jewish people. America, Said condemns as the greatest enabler of Zionism as the preeminent imperialist power. In his appraisal of Zionism, Said observes three things fundamental to its nature: (1) it completely discounts the existence of the Arab people living in Palestine, treating the territory as “empty” in a manner reminiscent of the Puritan settlers of America, (2) it treats Zionism and the growth of Western power as complimentary in a teleological way, paving the way for the “civilizing mission” of Zionism, mediating and bringing the European sciences to the benighted Arab natives, and (3) it advances a plan for a colonial-style system of land acquisition (p. 24). All of this would be impossible, Said observes, without European imperial ascendancy in the 19th and 20th centuries. Zionism is part and parcel of Zionism; this is why, he claims, postcolonial peoples the world over empathize with the Palestinian cause (he states this without producing evidence). They can “see” Zionism for what it is. It fundamentally imperialistic and exclusionist ethos is the reason why no Palestinian can allegedly glean or extract any positive or redeeming sense from Zionism, and why no Israeli can fully understand what a disaster the Zionist project has been for the Palestinians. Zionism was cast by Herzel as a solution to the problem of Jews in Europe, and it was sold under the banner of European territorial aggrandizement. “Imperialism” is more than simply territorial; it involves ideas and ownership of ideas. Thus, imperialism does not just conquer territory, but it offers a rational, “scientific” basis for that aggrandizement. In the case of European colonialism, this is the claim to racial superiority. This scientific basis for European expansion – it goes without saying – legitimated it. Thus, the seizure of others’ lands could be justified on the basis that the natives allowed the land to lie fallow or “unproductive” (at least by European standards). This was famously used as European justification for seizure of land in North America from the natives: the land was “empty” because the people living there were not using the land for a higher or nobler purpose. Thus began the project of reproducing “little Europes” around the world in such places like Rhodesia and South Africa. What was striking about the rational/scientific basis for European imperialism is that it gave these projects an air of normality (30). Seemingly incongruous developments – such as white settlement around the Cape of Good Hope, began to be construed and believed by Europeans as “natural” or normal, a positive good. What Said emphasizes in the rest of his chapter is the ‘identity’ (really, a purported lack of identity) of the Palestinian Arab in the Zionist mindset as an absolute non-entity, completely unworthy of consideration. This, Said argues, is a vestige of European imperial taxonomy/racial classification and imperialism. Shohat, Ella. “Sephardim in Israel: Zionism from the Standpoint of Its Jewish Victims.” In Dangerous Liaisons: Gender, Nation, and Postcolonial Perspectives. Edited by Anne McClintock, Aamir Mufti, & Ella Shohat. Minneapolis: University of Minnesota Press, 1997. 39-65. This chapter appears designed mostly to damn Israel for its supposed maltreatment of Sephardic Jews in Israel (whom Shohat somewhat awkwardly and contestably labels “Jewish Arabs” (?). Shohat chronicles how Ashkenazi Zionists – the ‘true’ Zionists, it appears, in her estimation – have appropriated the Orientalist discursive style of the Europe from whence they have sprung, and applied it to the Sephardic Jewish population that they imported into Israel. Shohat somewhat tests my credulity by arguing that the Ashkenazim imported thousands of Sephardim in order to fill labour shortages that they would not fill with non-Jewish workers, in order to remain true to an alleged Hebrew-Enlightenment axiom (and socialist ethos) among primitive Zionists that stipulated that the resurgent Jewish state in Palestine must not ‘exploit’ the industry of non-Jews. Shohat argues that the Sephardim who moved to Israel from the rest of the Middle East did not emigrate from their traditional homelands because of pressure from Arab states to leave. She conspiratorially claims that Zionist terror cells and Israeli agents committed false-flag operations in Arab states, terror bombing Jewish communities and blaming the attacks on their Arab neighbours in order to sput the frightened Jews toward leaving for the supposed ‘safety’ of Israel. Moreover, the massive influx of Ashkenazi settler-colonialists into the Levant from Europe supposedly chipped away at the Arab Christian and Arab Muslim tradition of distinguishing between their Jewish neighbours and Zionists, as the two came to be increasingly melded together. Sephardic Jews were soon forced to choose sides. Shohat goes on to talk about the terrible persecution and discrimination leveled at the Sephardim in the modern State of Israel. She suggests that the Orientalist stereotypes European imperialism applied to Arabs, Ashkenazim apply to their Sephardim ‘brethren’. The latter are a constant reminder to the former of the ‘Eastern’ nature of the state of Israel, something European Jews would like to suppress as they set about creating a modern European state in the Middle East. As she writes, “The Zionist master narrative has little place for either Palestinians or Sephardim, but while Palestinians possess a clear counter-narrative, the Sephardi story is a fractured one embedded in the history of both groups. Distinguishing the ‘evil East (the Muslim Arab) from the ‘good’ East (the Jewish Arab), Israel has taken upon itself to ‘cleanse’ the Sephardim of their Arabness and redeem them from their ‘primal sin’ of belonging to the Orient” (p. 44).The Sephardim can basically be reduced to the caricature of the ‘blacks’ of the modern state of Israel: “The Ostjuden, perennially marginalized by Europe, realized their desire of becoming Europe, ironically, in the Middle East, this time on the back of their own ‘Ostjuden,’ the Eastern Jews. Having passed thorugh their own ‘ordeal of civility,’ as the ‘blacks’ of Europe, they now imposed their civilizing tests on ‘their own’ blacks” (58). This chapter is very informative, but readers beware, it is also very tendentious and agenda-driven, seeking to vilify the State of Israel. Notes from C.S. :While there are thought catalogues that bring on “different” perspectives from other countries, yet the discourse still has an overarching one-dimensional perspective, and the issues are centered as identified by Western codes, which have a colonial nature (Hall, 1997). To start up the process of understanding, the concepts inherent within us would first need to be decolonized. just look at the list of contributors.